I never read A Tale of Two Cities, but this movie is a tale of two motherhoods: one in which moms strive to be perfect and shield their little snowflakes from any disappointment or discomfort; the other in which moms put self-care front and center and let their kids sort things out for themselves. Doing the latter, apparently, makes you a "bad mom." So ignoring the sort of offensive terminology for the way some of us already parent (ahem, ahem), the movie speaks pretty bluntly to the challenges of motherhood. I'd be politically correct and say "parenthood," but frankly, it's not the same. Dads - even stay-at-home dads - just don't have the same societal expectations placed upon them that this movie quite poignantly addresses. This movie is a mainline into the average mom's brain. This isn't just a movie to giggle at with mom friends after having a few drinks, though that's certainly been a selling point of the experience. I don't actually know anyone who has seen it who isn't a parent, though the stoned 20-something couple behind me in the theater certainly didn't enjoy it as much as I did. And judging from their loud commentary, they didn't understand it either. The movie premise isn't difficult or even very complex--Mila Kunis is an unbelievably hot mom of middle-school aged kids (ok, I added that part because really, what mom looks like Mila Kunis after having 2 kids?) who basically has a breakdown trying to "do it all" and decides to rebel against the expectations of her fellow moms, her family, and even herself. The movie's appeal is in making jokes about the mundane and ridiculous everyday crap of motherhood. Mom bras? Bake sale restrictions? Grocery shopping without kids? Check, check, check. Many of the jokes are pretty safe but entertaining, but it does have a couple moments of rolling-in-the-aisle laughter which is more than can be said for most comedies. The rest? Well, the rest is sort of depressing. Many of the issues and stresses of relationships and work and parenting depicted in the movie are a little too realistic at times. Fighting with a spouse about household duties? Failing at work because of childcare obligations? Secretly wishing you were injured in an accident so you could rest in a hospital by yourself? Check, check, check. 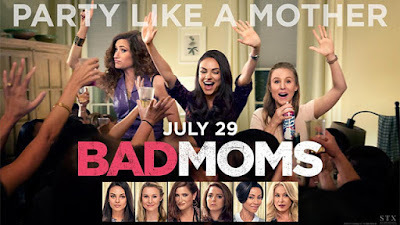 Even when done in a cheesy and over-the-top kind of way, the message of "moms struggling against expectations" still rings through enough for viewers to relate to it. But naturally, I couldn't ignore the fact that this is a pretty white, middle-class storyline. Sure, Jada's in it (and not ruining the movie! ), but all the moms are white and the way they deal with their problems tends to be pretty... suburban. 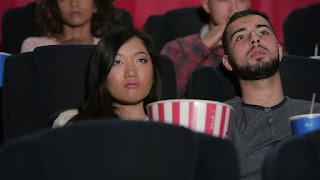 I know it's just a movie, and it's marketed to capture the largest swath of people, so I'm not going to ask why they couldn't have cast one of the main characters as a person of color (oops, I guess I just did), but if you don't fit neatly in the demographic box this movie was clearly written to appeal to I can't say whether or not you'll like it. Which really, I'm ok with. Women deserve their own movies, especially comedies, whose success doesn't hinge upon whether or not male audiences will watch it. Final word: A bit safe, but makes for an entertaining night out for middle-class moms.